We looked at the 12 most popular pregnancy tests on the market and considered them for ease of use, clear instructions, easy to read results, accuracy history, customer opinions and comments and other considerations. The First Response Early Result Pregnancy Test, came out on top in all categories. There are a large number of different pregnancy tests on the market from the well-known brand names of generic tests sold in bulk. There are several factors that you will want to consider before purchasing a pregnancy test. It is these factors that will help ensure that you purchase a test that you can trust and rely on to give an accurate answer. There are many things that make one pregnancy test better than another. We will provide you with the information you need so you can sort through the choices and purchase the one that is right for your needs and situation. Most women that use pregnancy tests worry that they are not accurate. This problem can be eliminated with the proper knowledge on how to use them and more importantly when to use them. First Response is one of the most well-known names in pregnancy tests. They have been around for decades and have built a reputation as being accurate and reliable. This 3 pack of tests will help you determine if you are pregnant or not and can work sooner than any other test; as early as 6 days sooner than your missed period. It is able to detect even tiny amounts of HCG, the pregnancy hormone which is why it can detect pregnancies earlier than other tests. The long, comfort grip handle is easy to hold so users don’t have to struggle anymore while trying to ensure accuracy when urinating on the test area of the stick. The test stick has a 50% wider tip than the old tip was which makes it easier to target. It has a large, easy to read window with easy to understand results: 1 line – not pregnant, 2 lines – pregnant. You will have your results in 3 minutes. 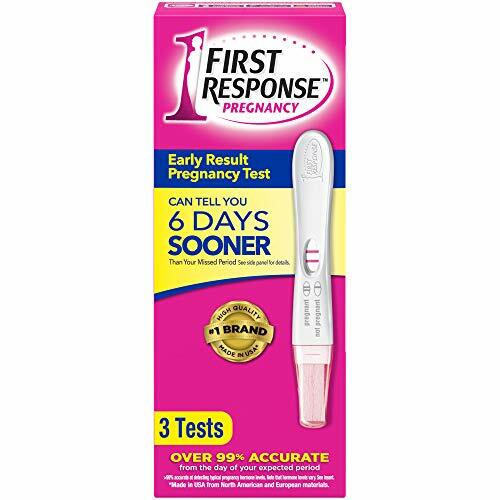 First Response Early Result Pregnancy Test is the #1 selling pregnancy test brand. It states over 99% accurate from the day you expect your period to arrive. Clearblue Digital Pregnancy Test with Smart Countdown lets you know that the test is working properly and that the result is coming. It is the only test with this feature. The results of this test are given in words stating either “pregnant” or “not pregnant”. This hygienic pregnancy test has a cap that you can put on the end after gathering the urine and the wider tip makes it much easier to conduct the test accurately. You can also gather the specimen in a clean plastic cup as well and do the test that way. The Floodguard technology inside the test eliminates errors by preventing any excess urine from getting inside the device and ruining the test results. 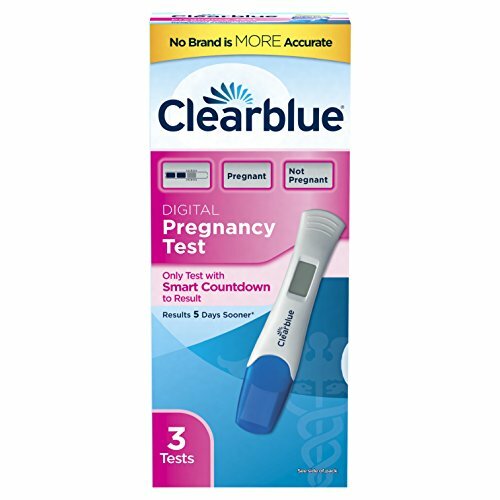 Clearblue Digital Pregnancy test is over 99% accurate when you test on the day of your expected period. You can even test up to 5 days before your missed period. First Response does it again even bigger with the Pro Digital Pregnancy test kit with app access. This is the first and only pregnancy test to be Bluetooth enabled.The app sends users a secure result to their smartphone and there is a personalized action plan and cycle and pregnancy support as well. This is definitely a unique testing experience that users will enjoy the thoroughness of.Users can test as early as 6 days before the day you miss your period and you can use the test any time of day. Although first-morning urine contains the highest levels of HCG, First Response is sensitive enough to not require it.If you are pregnant, you will enjoy the interactive app that gives you personalization in the form of an action plan that includes trackers and estimated due date calendar too.This test is over 99% accurate from the date of your expected period. If you think you’re pregnant, get the #1 selling pregnancy test brand on the market. With so many pregnancy tests on the market, it may be difficult to choose one that you can trust. Many women worry about accuracy and want to find a test that they can trust to be correct. All three of the pregnancy tests that we have reviewed are well-known brands that have been around for a very long time. Because of their excellent reputations, any one of these choices would be a good choice for you to find out this very important information. With digital options, apps you can use on your phone and accuracy that can be relied on, you will be assured that you are getting the most accurate result you can. If you want to learn a little more about the factors you should look for when choosing a pregnancy test, read the buyer’s guide below. It will provide you with the information you need to sort through all of the different choices. There are several things that you will want to know about a pregnancy test before you purchase it. We have outlined many of the most common questions that women want the answers to when they are looking to buy a test. How early is the test about to detect a potential pregnancy? How many tests are in the box? Is the test easy to use? Does it offer a specimen cup option, even if it doesn’t supply the cup? All of these questions pertain to the test itself. You want to be sure that you are purchasing a test that will have all of these questions taken care of. Below we will go over a few of the considerations in detail and explain their importance. Early Pregnancy Detection – Everyone who either wants to be pregnant or is worried about being pregnant wants to find out as soon as they possibly can. The majority of pregnancy tests are designed to detect the presence of the pregnancy hormone, human chorionic gonadotropin or HCG. This hormone will show up in the blood or urine if there is a pregnancy present. This hormone will usually start showing up in the urine 6-10 days after conception. The sensitivity of the pregnancy test will determine how soon this hormone is detected. Some of the better brand name tests are extremely sensitive and can detect HCG very early, when there is 50-100 mIU/ml of the hcg present. Detecting a pregnancy early on can ensure that the woman gets the proper care right off the bat to ensure a healthy pregnancy and baby. Cost of the Test – Pregnancy tests come in a huge range of price points and you can get them locally or online. Online ordering offers women great discounts from what they usually run retail. Some of the generic tests online can be as little as $1.00 each when you buy several, but many people worry about buying these super inexpensive tests. The higher brand names have dropped considerably in price from where they were 20 years ago so it is always better to purchase the well known brands to afford yourself peace of mind about the results. Mid-stream and Dip Style – Women can conduct the pregnancy two different ways: mid stream, where the user urinates on the stick tip; or dipstick style where the urine is captured in a clean, plastic cup and the tip of the pregnancy test is dipped into the urine for the allotted time. Many women find the dipstick method much easier to do and less worrisome that there was enough urine on the stick from trying to use it mid urine stream. Easy to Use – Both ways of testing with the pregnancy tests are simple to do and easy to follow. Many women don’t know that the test needs to be in the urine stream for 7 seconds and then the cap is replaced and you can wait for the results in 2-5 minutes. Whichever way you choose to conduct the pregnancy test, be sure to read the directions first and follow them exactly. Width of the Test Strip – Test strips that are wide are much easier to use than the narrow little tiny ones. The wider test strips are much easier to use and to read. Customer Feedback – One of the most reliable ways you can learn about the pregnancy tests you are considering or if you haven’t found one yet, is to see what other women have to say about different pregnancy tests they’ve used. Of course not all feedback will be positive because no one product will make EVERYONE happy, but you can get a very good idea of the quality and popularity of the different pregnancy tests by seeing what people have to say. There are several different types of pregnancy tests on the markets. We’ve outlined the different tests below so you can identify the differences. Urine Stick Tests – These are very simple in design. Place the test stick into the urine stream and keep there for 5-7 seconds. If the test is able to detect hcg in the urine, it will show a positive result. The simple urine stick test is relatively inexpensive to purchase as well. One complaint that users may have about some of the urine stick tests is that they are difficult to read and they can make the user question the results. Digital Urine Stick Tests – The digital tests are similar to the urine stick tests but the results are shown in actual words rather than symbols or lines. They are more expensive than urine stick tests but they have been designed, in most cases, to be very sensitive so they detect pregnancies much earlier than the simpler test sticks can. Combination Ovulation Test and Pregnancy Tests – If you are trying to get pregnant, getting these kits that have both ovulation and pregnancy tests in them. In these tests, you will start by using the ovulation detector tests to determine when you are ovulating. When it is time to check and see if you are pregnant, there are no other tests to purchase because you have the pregnancies in the box already to use. They are a very convenient way to find your most fertile days and then get that positive result you’re hoping for. The complete kits will cost more but if you do your research, you can find some great combo deals. With so many choices of pregnancy tests on the market, choosing one can be overwhelming. Choosing a good quality, reliable pregnancy test can provide the results and accuracy you want in a test. No one wants to worry that the test result they are seeing are not trustworthy. The higher quality brands are known for their accuracy and reliability so they are always a good choice when it comes to choosing. The information in this buyer’s guide is designed to help users understand a little bit about how pregnancy tests work and how to sort through the numerous choices to purchase one that is just right for your needs. Unlike the pregnancy tests of decades past, the modern versions are much more sensitive and can detect pregnancies before a woman’s cycle is even supposed to start. This early detection is very desirable to people who are anxious to find out one way or the other whether they are pregnant or not. Top 10 Bread Pans Bread Pan Buying Guide Bread pans are made from many different materials and they come in many shapes and sizes….